Have you ever seen stains disappear when you had your carpets professionally cleaned and then reappear once the carpet dried? This is called a recurring or reappearing stain, and it is different from other types of stains. This article explains how they happen and what, if anything, can be done about them. Sometimes a spill on carpet will soak through into the backing of the carpet and perhaps into the carpet padding underneath, as well. Proper professional carpet cleaning thoroughly cleans the carpet’s surface only, not the backing or padding. 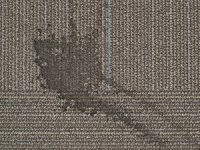 While the stain may have been removed from the carpet, as damp carpets dry, the carpet fibers can act like a wick, absorbing and transporting stains from the carpet backing and/or padding to the surface of the carpet. This phenomenon is called “wicking” and is the cause of recurring stains. The Academy of Textiles and Flooring (Floor Covering Dictionary, Fifth Edition) attributes reappearing spots to two causes, that is, wicking or some sort of residue on the carpet. The use of a transfer medium, (cotton toweling is best) placed over the damp area with enough weight to create good fiber contact, will transfer the remaining spot from the fiber tips on up into the toweling and solve this problem. These spots respond initially to cleaning but then reappear days or weeks after cleaning are usually attributable to soil-attracting residues which was left on the fiber after cleaning. Usually a sticky substance, either that which caused the original spot or residue of an improperly formulated or rinsed spotter are the real cause. […] These spots can always be corrected by removing the sticky source. This may require extensive rinsing followed by a transfer medium. Actual wicking from the back may occur after a large spill of an oily substance such as salad dressing. Removal may involved surfactants, absorbent powder and even treating the backing and removal of padding. While we offer no guarantees for recurring stains and do not clean subfloors, we will certainly do our best to remove or minimize the appearance of recurring stains on the surface of your carpet. Sometimes further cleaning achieves the desired results. Accelerating the drying process by setting up fans and cranking up the HVAC system can keep stains from wicking through to the surface. We may also try cleaning or treating the area with encapsulation products, which can retard or prevent the wicking process. Although you can certainly check your carpet warranty to find out whether recurring stains are covered, it has been our experience that wicking stains are not included with stain guarantees. For example, SmartStrand® with DuPont™ Sorona® Carpet Warranty Summary, says, “No carpet is absolutely stain-proof.” The warranty specifically “excludes any residual stains or wicking that may occur,” with food, beverage, and other types of stains. The best way to deal with recurring stains is to prevent them from happening in the first place. To learn more about the proper way to quickly and thoroughly clean up after spills, which can help prevent recurring stains, see our Carpet and Interior Textiles Care Guide.